It's still a little bit warm here in Texas! But yes I want the holidays. This is so pretty! Gorgeous coloring and awesome that you could recycle so many elements. 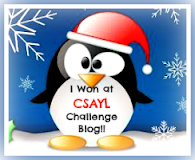 Thanks for playing with CSAYL. So beautiful! Loving the design! Thanks so much for playing along in my "seasons" word play saturday challenge at my creative moments! So pretty with the white on white. A great take on the sketch! Thanks for joining us at CSAYL!! !